A Belgian court on Monday rejected an extradition request for a Spanish rapper, who has been sentenced to three-and-a-half years in jail for allegedly praising terrorism in his songs. Jose Miguel Arenas Beltran, better known as ‘Valtonyc’, is one of several Twitter users and rappers who have recently been tried in Spain for glorifying terror or for insulting the king. ‘The judge has decided there will be no extradition,’ one of the musician’s lawyers, Simon Bekaert, said after a court hearing in the northwestern Belgian city of Ghent. The court argued that it is a freedom of speech case, therefore rejecting the crimes of glorification of terrorism, slander against the crown and threats in his song lyrics. The Belgian prosecutor has announced an appeal against the decision, which comes after in August Belgium already rejected an automatic extradition and granted the artist provisional freedom. The 24-year-old musician from Mallorca was traced to Belgium after he published a blurry photograph on his Twitter account showing a canal and a red and white tourist boat typical of Ghent. Spain’s National Court, which last year found Valtonyc guilty of glorifying terror, insulting the king and making threats in his lyrics, issued an European arrest warrant after the sighting. ‘I am very happy for being free and not extradited, but at the same time I am very sad at the colleagues in Spain who are not free and who have no fair trial or justice,’ were Valtònyc’s first comments to the press after knowing the Belgian ruling. The artist was implicitly referring to other artists in Spain facing jail time over their lyrics and the Catalan pro-independence leaders in pre-trial jail, among others. 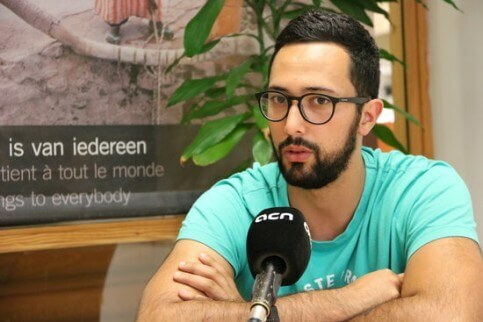 The arrest warrant for Valtonyc came just months after Catalan separatist leaders went into exile, also in Belgium, to escape Spanish authorities over their role in a failed secession bid. ‘I am very happy for you and for democracy,’ Catalonia’s deposed president Carles Puigdemont, who now lives in Belgian exile, said on Twitter. ‘Europe is an area of freedom where the abuses of certain states are finally unacceptable,’ Puigdemont added. Beltran was sentenced for lyrics in songs published online in 2012 and 2013 at a time when he was a little-known rapper in the Balearic Islands. The reference to the Basque Country was understood as a nod to violence by ETA, the separatist group that for decades staged attacks across Spain that left more than 800 officials and civilians dead. His lyrics have divided opinion in Spain, with some saying they would not land him in jail in any other democracy, while others stress that free speech has its limits. One of his Valtonyc’s lawyers, Gonzalo Boye, said that Spain should start ‘applying European and democratic standards’ if they do not want to face again ‘embarrassing situations’ like the one in Ghent on Monday. ‘Reducing sentences is not enough, we need these not to be crimes, because we are talking about freedom of speech cases,’ added Boye. Despite the judicial decision in Belgium, Valtonyc announced he will continue his plans to take the case to the European Court of Human Rights (ECHR). ‘We have come to win it all, we will go to the ECHR to set a precedent,’ he added outside the court in Ghent. Europe’s justice has ‘rectified the Spanish justice again’, said Catalan vice president Pere Aragonès. ‘Freedom of expression is protected in Europe,’ he added. The Mayor of Barcelona Ada Colau also celebrated the Belgian decision. ‘The Spanish judiciary should assess what is happening before their discredit becomes irreparable,’ she said. Meanwhile, the Spanish People’s Party (PP) harshly criticised the Belgian decision. ‘Belgium cannot become a sanctuary for fugitives of the Spanish justice,’ said the leader of the PP in the European Parliament, Esteban González Pons. According to him, the Ghent court decision ‘puts into question’ the Spanish ‘national sovereignty’ and the ‘Spanish justice’. González Pons urged Spanish president Pedro Sánchez to ‘react immediately’ and insisted that the European Arrest Warrant system should be reassessed so that ‘criminals sought for serious crimes’ cannot flee. The president of the PP in Catalonia, Xavier Garcia Albiol, wrote on Twitter that ‘Belgium has definitely become a problem for the EU’.